If you run into trouble at any time while ordering, please call us at 651-644-7333. We welcome your feedback as well at info@macmh.org. Please note this guide is California Specific. This guide equips educators with the tools needed to reach all students. Includes information on what you may see if a student has a mental health disorder, instructional strategies, and classroom accommodations. Revised and updated to reflect the changes in the DSM-5. Lesson plans for grades 1 – 8 that increase awareness about children’s mental health and build supportive, caring classroom communities. 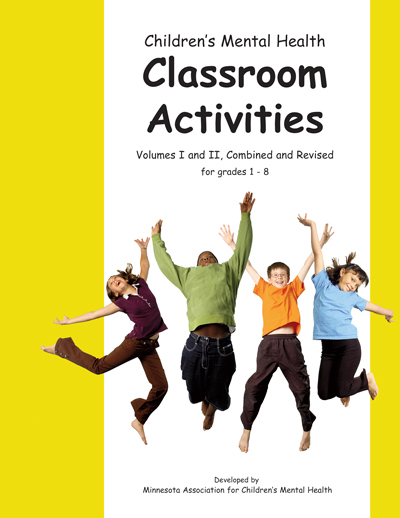 PLUS, activities that address different modes of learning. Classroom activities and curriculum to end hurtful teasing. Designed for Kindergarten – 2nd Grade. For parents of children with mental health challenges and disorders who are living in Minnesota, this guide is designed to help caregivers navigate the multiple complex systems they may encounter when advocating on behalf of their children. This guide is also a valuable resource for Minnesota educators and mental health professionals.